First, having quoted John 1:1 in Greek a few thousand times in my life, I think I ended up trying out for a spot on the TBN team at one point last night, but without an interpreter. My apologies. Ahmad Deedat’s comments on John 1:1 were inaccurate and incorrect, you will remember that I documented that he didn’t even have the proper Greek terms…..he was actually unable to handle the Greek language, he claimed to be able to do so…..I’m not sure how you are able to properly understand his (Deedat’s arguments) upon not being able to read the language…..in the process he demonstrates that he (the person in the video, not Deedat) cannot read Greek…..he doesn’t known the difference between a v and a nu , he regularly mispronounces the words and he (the person in the video, not Deedat) just does not know the language. 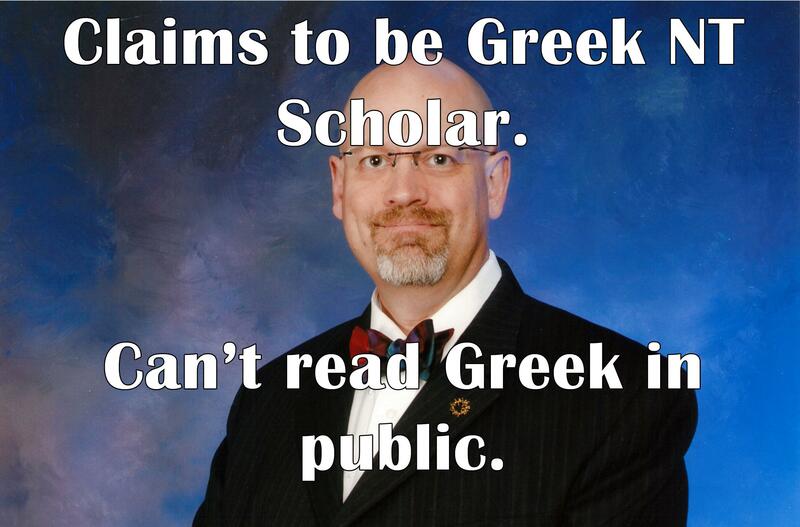 Unfortunately for James, it seems as if his hypocrisy has shown through his facade of using the Greek language. If he can produce a 9 minute video condemning Shaykh Ahmad Deedat (who never formally studied Greek), as opposed to James claiming to have studied Greek and using one verse’s Greek ‘a few thousand times‘, that either means James has to produce a video condemning himself while retracting the video about Shaykh Ahmad Deedat, or James has to concede that he is largely uneducated in this field. This isn’t a situation of ‘either or’, but a situation of ‘and’. Mr. White’s pretentious use of the Greek language was also exposed by myself earlier in this earlier post. What’s worse is that he can’t read Greek by himself, as James has stated that he needs an interpreter as he wrote himself (as seen above). Anyway, Zakir was talking at the speed of sound in the rebuttal period (as my notes show) and it was next to impossible to keep up with the references as they flew by. At one point he raised the issue of the Matthean reference to the prophecy (2:23) about the Nazarene. I did a quick search on my computer looking for the right reference and…got the wrong one in my haste. I did a quick search on my computer looking for the right reference and…got the wrong one in my haste. Oh, I got “branch” alright, but I wrote down the reference below what I wanted in the search list, Isaiah 14:19. My apologies. I didn’t have time to read but a single line, saw “rejected branch,” and scribbled it down. I will set up a donation fund for some prescription mid-range reading glasses. James, I think you need more than glasses. There are many vocational schools that can help you with your comprehension problem, but as for your integrity and dignity, I can offer you nothing but a broom to sweep the fragments of them off of the floor (I’m sort of cheap, get the scoop yourself). Finally, I did not get into the issue of the wavy hair and light skin because, as anyone can see, that kind of description could have been applied to any number of the Muslims attending the debate that night, and even some of the Christians. the only real issue is whether the term machamad is actually the name of Muhammad. I obviously argue that such a connection is absurd. Utilizing verbal roots in this fashion can be used to prove anything, as I have noted already by finding both Shabir Ally and Zakir Hussain in the Old Testament using the same methodology. But I did want to note two things for the sake of accuracy once again. First, at least two people have mentioned to me that I was in error on an ABN show regarding the root H M D in either Arabic or Hebrew, and I may have been, I haven’t taken the time to go back and try to find the comments. In ending, James’ article is nothing short of a direct result of being baptised by Br. Zakir. The term ‘baptised’ simply means to be ‘whelmed’ that is, ‘overwhelmed’ (see Strong’s Greek Lexicon: G907, ‘βαπτίζω‘). James White, was baptised into conceding that he was misinformed, deceitful and that he demonstrated clear cut pseudo-intellectualism. Br. Zakir most certainly did excellent to evoke such emotions from James White. Please do check out his debate, you will not be disappointed. Reblogged this on الله أحد. I’m sorry but your Muslim brother in his debate with Dr White was totally outclassed, I’m not a debater but I would done a better job. He didn’t even stick to the topic in question and started talking about almost everything in his rebuttal why? Well it must be because he didn’t have anything to say….he never quoted any of the Gnostic gospels which as Christians we know to be false…any how did they end up in the Koran? Your Muslim brother kept mentioning he had sources….I’m still waiting to hear what they are. At least James White has the ability to admit when he is wrong about something….but your Muslim brother was absolutely dealt with he was out of his depth…he should have taken on someone more on his level. 1. Unable to grasp all the references as used by the brother. 2. That he ignored certain arguments. 3. That he used incorrect information from an error filled Youtube video. That places Br. Zakir on intellectually sound ground, while James is on shaky ground. As for sticking on the topic, everything Br. Zakir said, was in relation to the topic, I didn’t see or note anything which was out of relation. Why would you expect him to quote the gnostic gospels, when the debate topic is centered on the Bible? Do you have any gnostic gospels in your Bible? To have done so would have been to go outside of the topic, I heard when James raised this same point and had to wonder if he was paying attention to the title of the debate! Such a silly premise! I don’t see how any gnostic gospels ended up in the Qur’an, sorry, but unless you have empirical evidences besides wild theories, you’ve lost me on that one. James himself acknowledged the numerous sources the Br. had and that he could not have kept up with writing them all down in his notes. So are James and I lying, or are you!? Don’t see how Br. Zakir dealt with someone who was out of his depth, as opposed to James ‘supposedly’ dealing with someone ‘not on his level’, when James himself fell prey to numerous inefficiencies. That either means James lowered his own stature to purposely make those errors, or Br. Zakir whooped him. I agree that White was demolished. Btw what do you say to White’s claim that the word Machmed (its actually pronounced as “Muhammad”/”Mahamad”) is used because of poetry, as it has a “clear sound” affect? And what about saying it is an adjective, not known? An excellent debate. James White got horribly “baptised” in this debate. My goodness. I want to see his sources that prove the prophet is in the bible i can so easily use the prophet Elijah to say he is like Moses. Moses saw storm, wind, an earthquake and fire upon Sinai. (Exod. 19:16-20; 20:18; Deut. 4:11; 5:22-27). Prayed that he might die. (Num. 11:10-15).